A guide to researching the history of Victoria's foundation and early settlement based on published and digitised sources. Victoria is home to many indigenous nations who had inhabited the land for thousands of years prior to European discovery and settlement. The continent of Australia is first sighted by the crew on Captain James Cook's Endeavour voyage at Point Hicks, located in the far east of Victoria between Bemm River and Mallacoota. George Bass sails through Bass Strait and sighted the coast around Wilson's Promontory and Western Port Bay. In late December Captain James Grant in the Lady Nelson examines the coast of what is now Victoria sighting and naming such features as Portland Bay, Cape Albany Otway and Cape Schanck. Between Cape Otway and Wilson's Promontory the Lady Nelson crosses the bight that leads to Port Phillip but Grant does not detect the entrance to the harbour. Grant returns in March to investigate the coastline between Cape Otway and Wilson's Promontory and survey Western Port. After surveying Western Port in December 1801, Lieutenant John Murray, aboard the Lady Nelson, enters Port Phillip Bay on 14 February 1802, explores Corio Bay and formally takes possession of the area for Britain. Matthew Flinders arrives in the Investigator in April, six weeks after the departure of Lieutenant Murray. 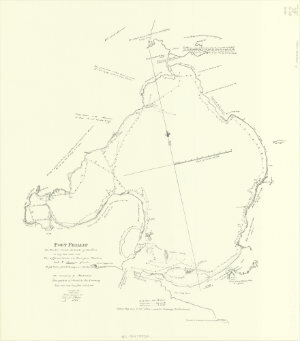 His survey of Port Phillip is the first detailed examination of the bay and surrounding country. In six days Flinders climbs Arthurs Seat, lands at Mornington and Indented Head, crosses Corio Bay to climb the You Yangs and examines Swan Bay and Queenscliff. Acting-Lieutenant Charles Robbins, surveyor-general Charles Grimes and gardener James Flemming sail around Port Phillip Bay and along sections of the Maribyrnong and Yarra Rivers. In January and February Grimes carries out the first complete survey of Port Phillip. A British convict settlement is established at Sullivan Bay near Sorrento in October 1803 under Lieutenant-Colonel David Collins but is abandoned shortly afterwards, mainly due to lack of water. Pastoralist Hamilton Hume and sea captain William Hovell journey southwards from New South Wales, cross the Murray River, Goulburn River and arrive at Corio Bay. A convict settlement is set up for a brief time at Corinella in Western Port Bay to protect the approaches to the bay from a perceived interest by French explorers in the area. Charles Sturt leads an expedition along the Murray River, arousing interest in settlement of land to the south. Victoria's first permanent European settlement is established at Portland Bay by pioneer Edward Henty on 19 November. Up till then the area had been used by whalers as a base from which to carry out their activities. Early 1835: The Port Phillip Association (originally the "Geelong and Dutigalla Association") is formed by fifteen of the leading colonists of Van Diemen's Land with a view to purchasing large tracts of land from the Aborigines on the unsettled South coast of Australia. 12 May: Farmer and businessman, John Batman and his party sail from Launceston on the Rebecca, entering Port Phillip on the 29th and anchoring at Indented Head. 6 June: John Batman, having sailed on to the mouth of the Yarra River, finds his way to a point which was probably Edgar's Creek (near Thomastown). He signs two treaties with the local Aborigines by which he claims 500,000 acres north of Melbourne and Corio Bay and 100,000 acres around Geelong and Indented Head. 8 June: Batman declares a point upstream from the Yarra River's mouth will be the site for a village, which was later to become the Melbourne of today (Batman subsequently leaves his party at Indented Head and returns to Launceston). 26 August: New South Wales Governor, Sir Richard Bourke, declares Batman's treaty invalid and the settlers at Port Phillip to be trespassers. 29 August: John Pascoe Fawkner's party which sailed from Launceston on the Enterprize on 12 July sets up a settlement on site just below Yarra Falls (Fawkner does not join his party until 16 October). 2 September: The party that Batman had left at Indented Head is lead by Wedge to the Melbourne site, arriving to find the Fawkner party already in place (Batman does not join his party until 9 November). Governor Bourke, concerned by the increasing number of illegal settlements at Port Phillip, appoints Captain William Lonsdale as Chief Agent of Government, Police Magistrate and Commandant for the Port Phillip Region. He takes up his duties in October. Governor Bourke grants squatters grazing rights beyond the "Limits of Location" subject to a £10 licence fee (effective 1 January 1837). Governor Bourke visits the Port Phillip settlement in March and approves Robert Hoddle's plan for a town which he names Melbourne. The first overland mail service between Melbourne and Sydney begins operating on 30 December. John Pascoe Fawkner's Melbourne Advertiser begins publication on 1 January (first copies handwritten). George Augustus Robinson appointed Chief Protector of Aborigines on 31 January, with headquarters in Port Phillip. Charles Joseph La Trobe is appointed Superintendent of the Port Phillip District and arrives in the colony on 30 September. Public meeting held in Melbourne on 5 May to petition for separation from NSW. Melbourne officially incorporated as a town on 12 August. Melbourne City Council established and Melbourne's first mayor, Henry Condell, is elected in December. Melbourne's first crossing of the Yarra River opens as a wooden trestle bridge at the site of what is now the Princes Bridge. Public meeting in Melbourne on 28 November demands separation from NSW and appoints a representative to take a petition to England. The Argus begins publication in Melbourne on 2 June (published by William Kerr and named Melbourne Argus until 1852). 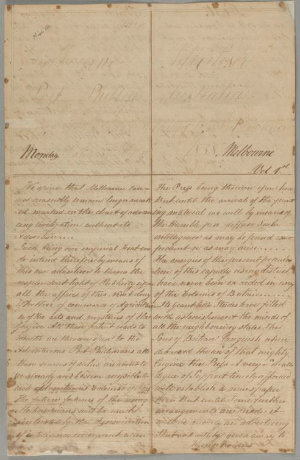 Melbourne proclaimed a city on 25 June (gazetted 5 February 1848). Town of Geelong incorporated on 12 October. Australian Colonies Government Act receives royal assent in Britain on 5 August, providing for the separation from NSW of the Port Phillip District, to be known as Victoria (as well as for the eventual self government of the Australian colonies). The Port Phillip District officially becomes the colony of Victoria on 1 July. Charles La Trobe becomes Lieutenant-Governor on 15 July. An election held for the Victorian Legislative Council in September with the official opening taking place on 13 November. Gold is discovered in Mount Alexander on 2 July and other areas in central Victoria soon after instigating a gold rush and a period of huge population growth and prosperity as immigrants arrived from all over the world to search for gold. Trace the early days of Melbourne and the Port Phillip settlement, from Batman's treaty to Fawkner's Advertiser, through our online gallery.